If you want to be Mayor of Houston, you have to reach out to voters in all neighborhoods of this great big diverse city. It also helps if you can speak a foreign language, or at least have a bunch of cool – looking political signs that suggest you do! On Wednesday I stopped by Mayoral candidate Peter Brown’s campaign office for an interview. Afterwards, Brown proudly showed me some of his new campaign signs and bumper stickers printed in Chinese, Vietnamese, Spanish and English. The signs are designed to help Brown broaden his base by reaching out to potential voters in Houston’s rapidly growing cultural melting pot. Will the signs help Brown in his quest to become the next mayor, or will some people think they are signs of political pandering? Who really knows, but remember not every voter speaks English. Also, don’t forget the city prints election ballots in both Spanish and Vietnamese. Brown is the only mayoral candidate with an aggressive campaign of radio and TV commercials, it can’t hurt for him to now start speaking a new (sign) language on the campaign trail. Anthony Kennedy Shriver was a special guest at an event in Houston on Wednesday. He spoke at the 7th annual Luncheon benefiting Legacy Community Health Services, which provides low or no cost primary healthcare and specialized health care to over twenty-thousand men, women and children each year. Kennedy Shriver is the Founder and Chairman of Best Buddies International, which he created to 1989 to foster one-to-one friendships between people with and without intellectual disabilities. During the luncheon, Kennedy Shriver, who shares the famous family’s trademark blue eyes, wavy hair and good looks, read from a book written by his late Uncle Senator Edward Kennedy, who recently passed away. Dozens of people attended the luncheon including: State Rep. Garnet Coleman, Giovanni Garibay of Comcast, and Hilton-America’s Paul-David Van Atta, who was honored with the Legacy Leadership Award. A few weeks ago, 2 on the Beat informed you that President Barack Obama plans to visit Texas A&M on Friday, October 16th. President Obama will honor former President George H. W. Bush and celebrate the 20th anniversary of the Points of Light Foundation. The timing of the trip falls in the middle of a national debate on controversial health care reform, and some Tea Party Groups are making plans to protest against the President. This may be our best chance to show up in (peaceful) opposition to this President and his administration & policies! With two Presidents in attendance, security will be extremely tight, but mark your calendar and be prepared to show up if a protest can be arranged. If anti-Obama folks do show up holding signs and yelling against the President’s policies, there will be lots of national and statewide media to cover the protest. On the other hand, with so much anger and the unprecedented number of death threats targeting President Obama, you can bet that the U.S. Secret Service and local law enforcement will do their best to keep the Tea Party Members far away from the event. 2 On the Beat is scheduled to report on the President’s visit. I will keep you posted on the details and the plans to protest. Some Houston police officers will no longer have to buy their own tactical vests or worry about lacking some of the basic tools they need to protect the public and themselves from danger while in the line of duty. The Houston Police Foundation, led by chariman Tilman Fertitta, has made a significant donation to the Houston Police Department. On Thursday, Chief Harold Hurtt and Assistant Chief Vicki King accepted the items donated to the Narcotics, Bomb Squad, the Special Response Group (SRG) and SWAT Detail. The Foundation also donated medical kits, computer workstations and other supplies for the officer down-time room, an area that gives the men and women in blue a place to rest between shifts and off-duty court appearances. To make a donation or to learn more about the Houston Police Foundation visit www.houstonpolicefoundation.com. Houston Mayoral Candidate Annise Parker is jumping into the TV political ad war. Her campaign’s new ad titled “Annise Parker Delivers” focuses on the crime problem in Houston, and discusses Parker’s record and vision for the city. 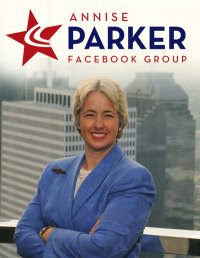 The ad begins running today, and it also touts Parker winning the endorsement of the Houston Police Patrolmen’s Union. Most political analysts say that Parker already has the highest name identification among all of the major mayoral candidates, so going up on TV a few weeks before the start of early voting can only help boost her name and ideas. Council member/Mayoral Candidate Peter Brown was the first to begin advertising on TV. Brown now has two campaign commercials and he is also running radio ads. That means that attorney Gene Locke is the only major mayoral candidate who is not up on TV, spreading his message to viewers and voters. No word on when or if Mayoral Candidate Roy Morales will launch a TV political campaign. I personally don’t know how reliable this poll is, but the Service Employees International Union, Local 1 and the Houston Organization of Public Employees, local 123 have released of a poll that shows Mayoral Candidate Annise Parker with a comfortable lead over her opponents. 1. Annise Parker leads her closest opponent by a 2 to 1 advantage in an initial vote preference for mayor. 2. Annise Parker holds a substantial advantage over her opponents in favorability and name identification. 3. When voters are read a completely positive introduction to each candidate, Annise Parker holds a double-digit lead over the rest of the field. 4. Voters in Houston are optimistic about the direction of the city, and give current Mayor Bill White a strong favorable rating. The poll was conducted by the national research firm Hamilton Campaigns, and is based on a survey of 400 registered voters who are likely to vote in the November 2009 Mayor election, according to the news release. You can visit www.houstonjanitors.org for more information about the poll’s findings and research methodology. Over the weekend, the group sent out an email calling Locke a proven leader, while blasting his opponent Annise Parker because she is gay. Christians for Better Government is releasing its voter guide to its 20,000 member list in the Houston area. In this election our city is faced with a major deficit and how best to turn our city around financially. That is why Christians for Better Government has decided to endorse Gene Locke for Mayor. Gene is the proven leader this city needs “for such a time as this”. He is a family man and a person that knows how to get things done. He has always been on the forefront on issues that affect the community. Gene understands the community and its needs; the others only talk about understanding. Here is why Peter Brown and Annise Parker are not the best choice for Mayor. Peter Brown puts out false claims that he is a champion for issues affecting the community. Annise Parkers lifestyle that of being a HOMOSEXUAL is not the proper role model to lead the fourth largest city in the United States. The Bible speaks clearly against the lifestyle she represents, James 1:8 says, “A double minded man is confused in all his ways”. She does not believe in what the scripture says about her lifestyle which in return means she doesn’t believe in God. There is a real Houston group called Christians for Better Government that is headed by Rev. Willie Wright. I spoke with him early Monday and he said that he had nothing to do with the email. He said that someone has taken his group’s name to promote an agenda and attack a candidate. Is Governor Perry Losing His Edge? Are voters in Texas growing tired of the state’s longest serving governor? We’re still six months out from the March 2010 Texas Primary, but the latest poll numbers show that Governor Rick Perry has lost his edge over U.S. Senator Kay Bailey Hutchison. A telephone poll conducted by Rasmussen puts Hutchison at 40% and Perry at 38% among likey Republican primary voters. Just a few months ago, the Governor held a commanding ten-point lead over Senator Hutchison, who says she plans to resign her seat in late October to run for Governor. Perry is still a favorite of the most conservative members of the GOP, while Hutchison is preferred by those describing themselves as moderate, according to the poll. This troubling news for the Perry campaign comes just as the governor is enlisting former New York Mayor Rudy Giuliani to help him campaign across Texas and raise money for his reelection. During a trip to Houston earlier in the week, both Perry and Giulini attended a news conference at the Harris County Jail. Sheriff Adrian Garcia, a democrat, was noticeably absent from the photo op, but more than a dozen law enforcement officers from various agencies stood with Perry and Giuliani. Perry blasted the federal government for what he called its failure to protect the Texas border with Mexico , and once again repeated his demand for Washington to send one thousand national guard troops to the border. They held similar events in Austin, Dallas and San Antonio. After the news conference in Houston, the governor and former mayor attended a private fundraiser to help boost Perry’s campaign war chest, for what is expected to be a very expensive and tough primary battle. On Thursday night, the top four candidates for Mayor of Houston participated in the Forum on Quality of Life Issues, which was held at the Houston Garden Center in Hermann Park. Peter Brown, Gene Locke, Annise Parker and Roy Morales answered questions about water quality, visual blight , trees, landscaping, flooding and city parks. It wasn’t a fiery debate, but more of a discussion about how the candidates would prioritize and fund these projects if elected the city’s next mayor. Moderated by Nancy Sims of Pierpont Communications, the forum was sponsored by the Bayou Preservation Association, Houston Parks Board, Quality of Life Coalition, Scenic Houston, and Trees For Houston. Perhaps, more importantly than the topics discussed, the event could be one of the few remaining opportunities that voters will have to see all of the candidates on one stage , leading up to election day. As 2 On The Beat reported earlier, the candidates have decided to cut back on the number of joint appearances. Locke, Parker and Brown, have already held more than forty joint appearances, and not all of the events have attracted big crowds. The candidates say they’re tired of talking to each other, and they want to spend more time campaigning directly to people in the community and raising money. Are the candidates short-changing voters by limiting the number of debates and forums? We’ll have to wait and see, but if you are really interested in learning about the candidates you can always visit their websites, instead of waiting for them to show up at a forum in your neighborhood! I wrote this weekend about the mysterious and mean- spirited email that was circulating in the community, targeting candidates in the race for Controller of the City of Houston. I wanted to share an email that was sent to me today. HOUSTON (September 14, 2009)– On Saturday, September 12, 2009 at 9:34 P.M., a bogus email from “Larry Green” at “sunnysideprecinctjudges@gmail.com” containing racial and religious slurs targeting candidates running for City of Houston Controller. Larry V. Green, Esq., CEO of HoustonWorks USA unequivocally denies any association with this activity and is working with the Houston Police Department, the Federal Bureau of Investigation (FBI) and the National White Collar Cr hteime Center (NW3C) to bring those responsible to justice. Larry V. Green has reached out to Pam Holm, MJ Khan and Ronald Green (no relation), the three candidates running for Houston Controller to express his outrage regarding the email being sent erroneously under his name from an organization, “Sunnyside Precinct Judges” that doesn’t exist. Larry V. Green is not endorsing any candidate running for office. HoustonWorks USA own IT department launched an internal investigation and was able to determine that the email in question came from an anonymous Gmail account. HoustonWorks USA is working closely with Google the operators of Gmail in hopes of finding the original IP address where the email was sent. Founded in 1984, HoustonWorks USA is the leading provider of services focusing on job placement, continuing education and vocational training. Serving more than 900,000 annually, HoustonWorks USA provides job seekers with a variety of workshops including job search techniques, interviewing skills and resume writing, or use of the resource library with Internet access and postings of local, state and national job openings. Training is also available in career fields such as healthcare, business, computers and education. HoustonWorks USA manages several of the largest Workforce Solutions offices in Houston and the surrounding region for the Houston Galveston Area Council. These offices offer a wide range of services for job seekers as well as employers looking for trained workers. HoustonWorks also provides numerous youth programs including internships, scholarships, summits and summer camps. HoustonWorks is a 501(c) 3, tax-exempt organization. Visit www.houstonworks.org for additional information.